Use the promo code SUMMERNA to avail of the promo. The heat is on! Remember that summer should be spent with family and friends in a cozy place and with a lovely view of a pristine beach. 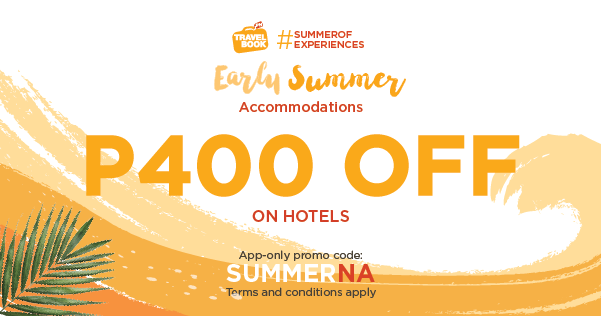 Book your getaway or staycation this season by using the promo code <SUMMERNA> using the travelbook.ph mobile app! 1. Use the app-exclusive promo code to get P400 OFF on your selected hotel. 2. This promo is open to new and existing customers of travelbook.ph. Minimum spend of PHP 2,500 is required to avail the promo. 4. Discount is valid for bookings done on the travelbook.ph mobile app only. 6. Booking period is from March 26 – 30, 2019 or while coupon stocks last. 10. The travelbook.ph mobile app must be at least the 3.1.13 (iOS) and 3.1.17 (Android) version to avail of the discount. 11. The discount is not transferrable to cash, and promo is valid for transactions in PHP only.